Opera superstar: Alfie Boe will perform at Sheffield Motorpoint Arena, on Friday, April 5, 2013. ALFIE Boe has added four extra dates to his 2013 tour - including Sheffield Motorpoint Arena, on Friday, April 5. 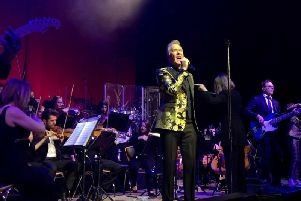 It follows his triumphant performances at the Queen’s Diamond Jubilee Concert during the summer and an extensive US tour. Pictures Martin Bostock'Saturday night at Lytham proms. 'Alfie Boe. “I’m so excited to follow up the Bring Him Home Tour which was one of the highlights of my career so far. To be performing in arenas is a dream come true and I can’t wait to get back on the road and see all my fans again in 2013,” he said. Boe, the so-called Nation’s Tenor, sold out a 23-date UK tour of Britain’s concert halls this year. He’s also sold 750,000 copies of his albums Bring Him Home and Alfie, whilst also fitting in a critically acclaimed West End run as Jean Valjean in Les Misérables. His autobiography, My Story, following a book deal with Simon & Schuster, was released last week. A live DVD of his Bring Him Home tour, which won over fans and critics alike, was also released earlier this year. At the Queen’s Diamond Jubilee Concert, watched by nearly 17 million viewers and in front of a 20,000 strong crowd at Buckingham Palace, he performed O Sole Mio / It’s Now or Never and duetted with soprano Renee Fleming, performing Somewhere, on the palace balcony. * Tickets for Sheffield Motorpoint Arena, Friday, April 5, are now on sale – buy in person from the box office, call 0114 2565656 or book online at www.motorpointarenasheffield.co.uk. For other tour details visit www.gigsandtours.com or www.ticketmaster.co.uk, call 0844 8110051 or 0844 8262826.